In the gospels, Jesus is recorded as doing many miracles. What did those who were healed do after they had encountered Jesus? While some followed, many returned to their homes and lives. What did they do as a result of their Jesus encounter? Would that encounter translate into an ongoing set of practices and beliefs? How would that set of practices and beliefs mix and merge with the set of practices and belief that would become Christianity? Sometimes, I try to imagine what might happen if two people who had experienced a miracle of Jesus ever met. What might trigger the storytelling which would suggest they had both experienced an encounter with Jesus? What resources would they use to assess each others practices and beliefs? Let me provide a specific example. What might happen when the healed leper in Mark 1 met the woman with the issue of blood in Luke 8? John Wilson, in his book on the history of Caesarea Philippi, notes that in history, for some 300 hundred years after Jesus death, Caesarea Philippi was a city with a celebrated statue. Residents of the city understood it was a statue of Christ, erected by a woman whom the Lord had cured of a flow of blood. (Wilson, John F (2004) Banias: The Story of Caesarea Philippi, Lost City of Pan I.B.Tauris). So imagine that the healed leper of Mark 1 – brought up God-fearer, monotheistic, no graven images, Jewish – sets out to share the story of his encounter with Jesus. Goes on a missionary journey, enters Caesarea Philippi ready to preach the message. Spots a statue. Potential outrage (being a God-fearing, monotheistic, no graven images, Jew), turns to confusion as he recognises the hands of the statue are like the hands of the person that touched him. Locates the statue owner, a woman. She has shared her experience of God’s touch with people, who now gather weekly around this statue to share stories of being touched by God. How do these two people, very different, begin to realise they are part of one, holy, catholic and apostolic church? If the group in Caesarea Philippi have developed a different set of practices and beliefs than the group of mobile missionaries, how will convergence begin to happen? Who gets to decide what is out of bounds church and what is not? A very weird feeling indeed. Big ups to the publishers (Zondervan), who worked all the channels on this one. I knew nothing about it until it arrived. is it my eyebrows? or my ecclesiology? Prodigal Kiwi, ever the electic, has been listening to Rowan Williams at the recent Fresh Expressions launch, while reading my The Out of Bounds Church? : Learning to Create a Community of Faith in a Culture of Change book alongside an essay by spiritual director, Sheila Pritchard. He reckons there’s a link. I hope it’s not the eyebrows! As, I suspect, does Sheila Pritchard! I’m stoked to have my The Out of Bounds Church? : Learning to Create a Community of Faith in a Culture of Change book described as “well-known” in a brief mention on Scot McKnight’s Jesus Creed blog, in a discussion on church and culture, with specific reference to the emerging church. In OBC book I myself propose a “third way” that is beyond two poles of either accommodation or relevance. I suggest the metaphor of a DJ – who, within a community, samples from multiple places to create a new mix. I argue this because we are now called to be Incarnational in a culture that is well beyond unitary categories. I suggest this is what the apostle Peter is doing, say in the household codes (1 Peter 3), where he is “sampling” from culture, yet in a way that expresses a new, and redemptive hermeneutic. With nods to Miroslav Volf and his impressive work around Christ and culture. Can I also say how important context is in all of this. Jim finishes with a wonderful story of deep mission in his book. What struck me, reading it, was how the couple described had been IN church before. While I celebrated the redemptive life they have found, it reminded me again of how churched the US still is, and in that sense how it is such a unique context for doing and talking about mission. For more reviews of Out of Bounds Church?, you could try Len Sweet here; Greg Hughson here; Tom Sine’s review here: Fuller Seminary review here; Scot’s original review here; Malcolm Chamberlain here and a fanhere. There is a lovely review of my Out of Bounds Church? : Learning to Create a Community of Faith in a Culture of Change (Emergent Ys) book just appeared on amazon.com. Titled: Written in New Zealand, published in US and quite useful also in Latin America it reads as follows: How does Taylor’s book translate into a Latin American situation? I would answer rhetorically: Was it not really written with churches in São Paulo in mind? To start with, the problems are the very same: churches, small and large, which, ignoring the obvious cultural changes, use the same communication and teaching methods of almost a century ago. This condition is perpetuated by pastors who seem not to live in the Age of Information. Therefore, also here in Spanish- and Portuguese-speaking America, the churches need to become missional in a postmodern way, responding with creative and flexible structures and movements to the culture of change. Not only the principles, but also the practical ideas presented by Steve Taylor in The Out of Bounds Church? apply perfectly to urban Latin America. They are relevant for São Paulo, Rio de Janeiro, Buenos Aires, Santiago, Montevideo, etc. We can see ourselves in the Kiwi book. Contextual differences play a lesser role than our share in postmodern culture. Then, dear Steve, “waiho i te toipoto, kaua i te toiroa” (Maori proverb: “Let us keep close together, not far apart”). Finishing with a Maori proverb. Now that’s classy aye! “This [my The Out of Bounds Church? book] is easily one of the two or three most impactful books I’ve read on the church and its future in the mission of God.” Thanks Jonathan, who’s kindly also provided a concise overview. OK, while I am busy congratulating myself, here is another positive review from Tom Sine’s new book, The New Conspirators. Under the heading; “A few writings about all things emerging” he notes that “one of the characteristics of the emerging stream is strength of imagination with a very high level of risk-taking and initiative … I think Steve Taylor’s book The Out of Bounds Church? : Learning to Create a Community of Faith in a Culture of Change best captures the spirit, imagination and playfulness of this (emerging church) stream.” So cheers Tom. Just noted a new (4 star) review of my Out of Bounds church? book up at amazon. REFLECTION: I read this book three times, and each time gleaned a little more encouragement and discovered new potential areas of personal ministry ….The nine “postcards” present snapshots … in aggregate they create an image of the emerging church as highly varied, rapidly changing, iconoclastic, community oriented and passionate about embodying the Gospel in culturally relevant ways … The wide variety also suggests that there are many more as yet undiscovered ways to “do” emerging churches. Bob is picking up on my way of framing gospel and culture, in which I use the image of a DJ to analyse how the relationship between gospel and culture could be; that rather than see them as monolithic wholes that we either embrace in total, or reject in total, that instead we see our lives as samples, or bit-sized pieces and that we are sometimes juxtaposing gospel and culture, other times subverting gospel and culture, other times, amplifying gospel and culture. I have continued to develop the DJ image since my book came out. Another example I find really helpful in terms of explaining the concept is the way that U2 use the song Bullet the Blue Sky in their Vertigo tour (DVD here). and the list goes on. Each sample adds layers of meaning, subverting, amplifying, juxtaposing meanings to produce a very potent piece of communication. Just working on a lecture exploring the place of imagination in the emerging church. For me, a critical missional issue is whether our emerging imaginations are formed by our negative experiences of church past. Or whether they are grounded in the creative and Kingdom story of Jesus. (The lecture includes drawing on a email conversation between Al Roxburgh and myself here). So I found some old unwanted tiles underneath the deck of my friends home, left discarded by the previous owner. 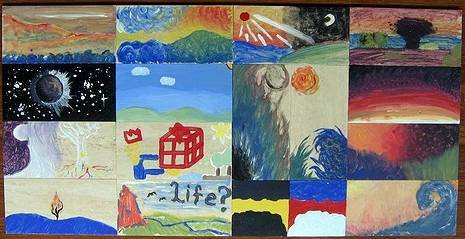 I brought them to our creativity and spirituality class and had each student choose a tile. They were extremely grimy so they were each asked to go wash them off. As they cleaned the dirt off of the tiles they were instructed to imagine themselves as the tile being cleansed by the hands of God. Some tables were put together with a large blue camping tarp laid over it. This again was to stimulate a fresh environment that was also conducive to creative messiness. Dollar store paint and brushes were laid out. It is so encouraging as an author to get feedback like this, so thanks so much Lon. And what a great metaphor for imagining God’s redemptive work, taking old, discarded tiles and creatively redeeming them, bringing colour and vibrancy into the world God loves. From Mark Shivers, graduate student at Vanderbilt University. I am using a honey of a paper he wrote on worship in postmodernity for my upcoming Masters paper: Critical Missional Issues for the Emerging Church. Paul Walker, who blogs at Out of the Cocoon, is blogging his way, chapter by chapter, through my Out of Bounds Book?. Pop on over and have a read. He writes: I enjoyed the book when I first read about 12 months ago, and Im enjoying the second read perhaps even more so. On the book front, I’ve also had emails from Canada and Spain in the last few days, thanking me for the book. It is quite humbling to sense that the book is connecting in such diverse – England to Canada to Spain – Western contexts. 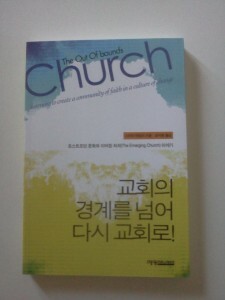 Korean translation of Out of Bounds Church? 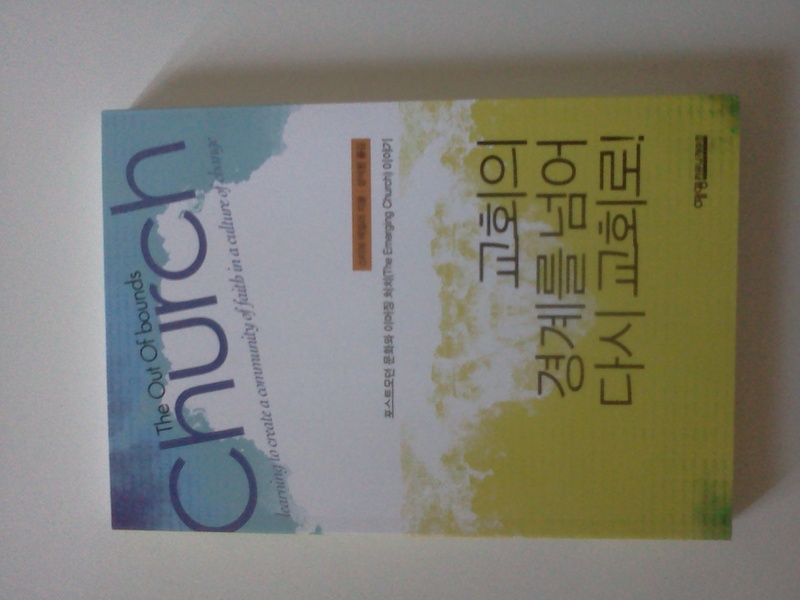 I have just been informed that Zondervan have licensed Jeyoung Communications to translate and publish The Out of Bounds Church? into Korean. It should be available in bookstores in about 18-24 months. I have friend who in a former life, did a stint as DJ on student radio. The DJ put through the regulation call, live, to the local surf reporter. Down the line came the local surf reporter; So Mr radio DJ, who made the dinosaurs? All this to say that you can ask me any question you want, live, on radio, this Sunday, 3 December. Between 9-11 pm, I am on the Green Room at Life FM. You can listen on the internet here. who blogs here. The show will include giveway copies of my Out of Bounds Church? book, kindly supplied by my publisher, Zondervan. Give me a during the show on 0508 LIFE FM. Or why not a few email questions from some of my overseas readers?